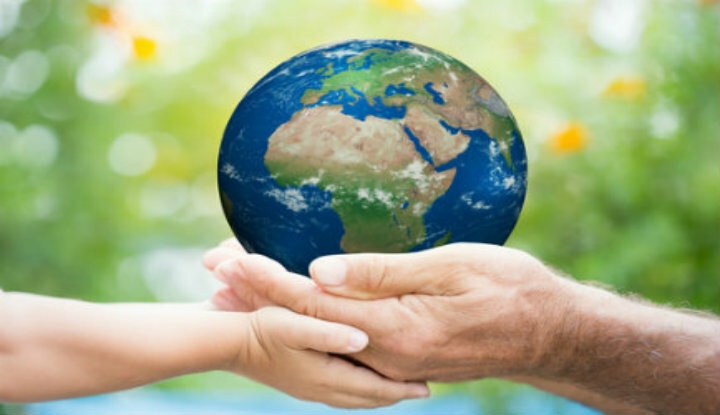 Have you ever found yourself wanting to be more environmentally friendly? If so, often times it’s hard to know where to start. So what do you do? One exciting option is green travel! Your travel choices can make a big difference, especially if you make them with sustainability in mind. By choosing socially and environmentally responsible hotels, tour operators, and transportation, you can ensure that your trip contributes to conservation efforts and the well-being of communities. 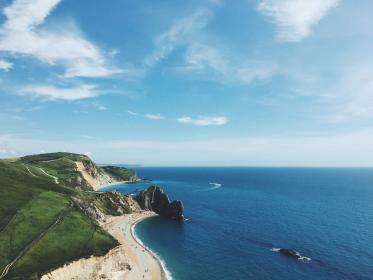 Technology plays a much larger role in travel as it empowers travelers to select sustainable travel options resulting in greening your trip plans, which is a fantastic way to contribute to environmental preservation! Dream: Find inspiration in a multitude of places. Read reviews on sites such as TripAdvisor written by travelers just like you. Ask your friends and family if they’ve ever been on a trip that was centered on sustainability. Look at the list of places that you want to visit and then do some research into which of those options is the most sustainable. 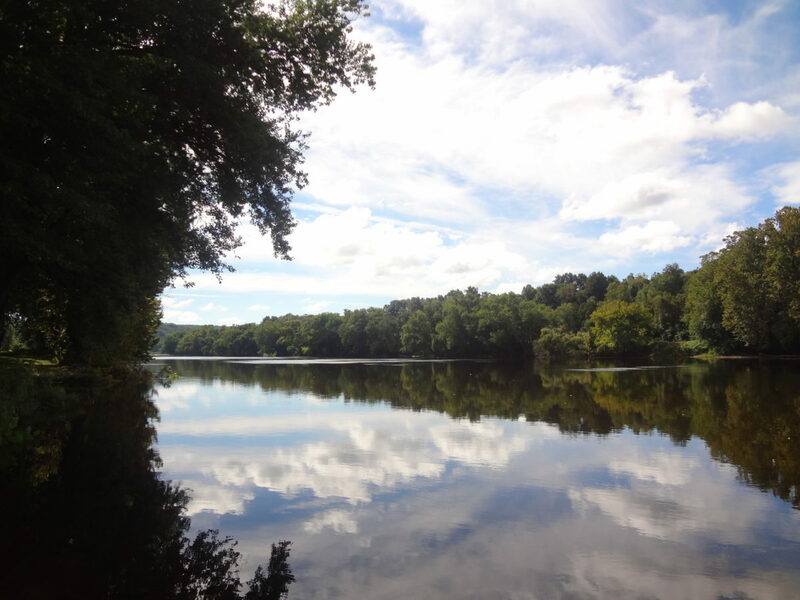 Plan: Choose a trip that strengthens the conservation efforts for the places you visit and enhances their natural integrity, including protected areas and wildlife habitats. EcoTraveller’s website is a great place to start. Go! A lot of cultures, by their nature, are inherently focused on sustainable lifestyles and less on consumerism, even more the reason to support them and gain an adventure in return! Immerse yourself in the differences of other cultures through learning about their customs and social norms before you visit, and embracing them when you are there, along with speaking their local language when at all possible, to receive an enhanced experience. Now you’re ready to plan your own green adventure, and I hope it’s a fantastic one! My latest trip that focused on sustainable travel was Discover Domenica The Nature Island. Where will your next Green travel destination of choice be? A method of finding new ways to be more environmentally friendly is to examine favorite hobbies and think of tweaks you can make to benefit the environment. I love to cook and spend a lot of time in the kitchen, so my plan is to focus most of my efforts in that space. If you are a foodie like me, you can look around your kitchen to find ways that your love of cooking can be joined together to create eco-friendly activations. Many of these options can also be applied to our in-office work routines as well. Say goodbye to bottled water and choose filtered. Bottled water is wasteful – energy is used to produce, ship and dispose of plastic water bottles. It’s easy to replace it with filtered water. Water filtering pitchers are inexpensive, which cannot always be said about bottled water that needs to be restocked. Reconsider how you store leftovers. Be cautious when buying containers to store your food in. Look for eco-friendly options such as glass or ceramic containers, and always make sure that they’re BPA free. Run dishwasher only when it is full. This way you will be conserving water and energy. Also, you can opt to go with efficient settings like letting the dishes air dry rather than using heat. Remember you can always dry them by hand too. Use Nontoxic Cleaning products. There are so many brands available to choose from nowadays. My favorites are Method, Ecover and The Honest Co..
Opt for Fair Trade. Buy fair trade organic coffee, teas, clothing and accessories. Make eco-friendly food choices. The 100-mile diet: local first; organic for high consumption foods. When ordering lunch how about going vegetarian or even vegan for one day of the week, hello #MeatlessMonday! Cutting down on meat can have a huge impact on the health of the planet. Also, make an adventure out of it and check out your local farmers market for a weekend activity. I really enjoy Dallas’s Farmers Market. Plant Something! Buy your favorite herbs and/or flowers and start a little garden. Recently I just purchased some fantastic mint, basil and oregano from Central Market. It’s fun to get your hands dirty and you’re also saving money growing your own! I must admit, I wasn’t sure what to expect when it came to the food in the Azores as I had heard mixed reviews when I was researching the cuisine prior to takeoff. 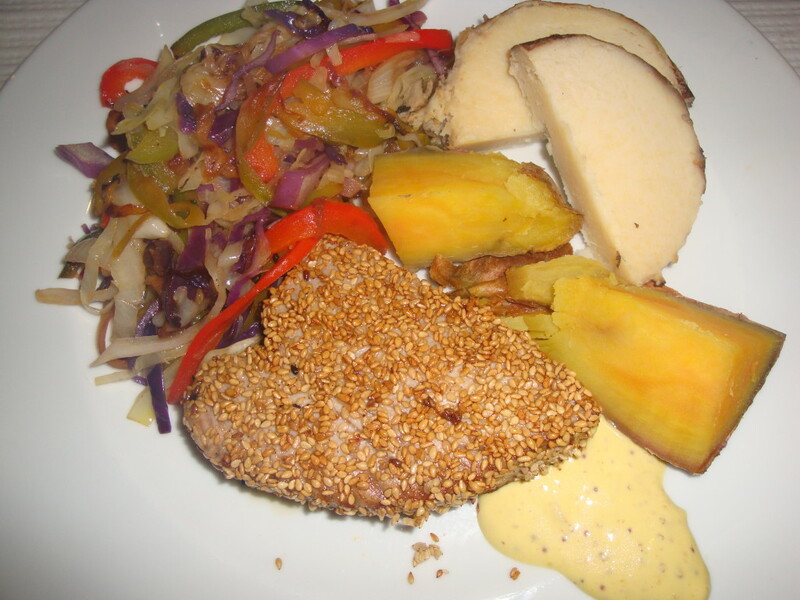 I was actually pleasantly surprised by several meals we had in São Miguel. We found Tasca using TripAdvisor when we were searching for restaurants for dinner. Tasca definitely delivered, it was my favorite restaurant of the trip and we actually ended up eating there twice! We ordered several appetizers on our first visit to Tasca. The prices were surprisingly low—I mean between 2 to 5 euros an app! 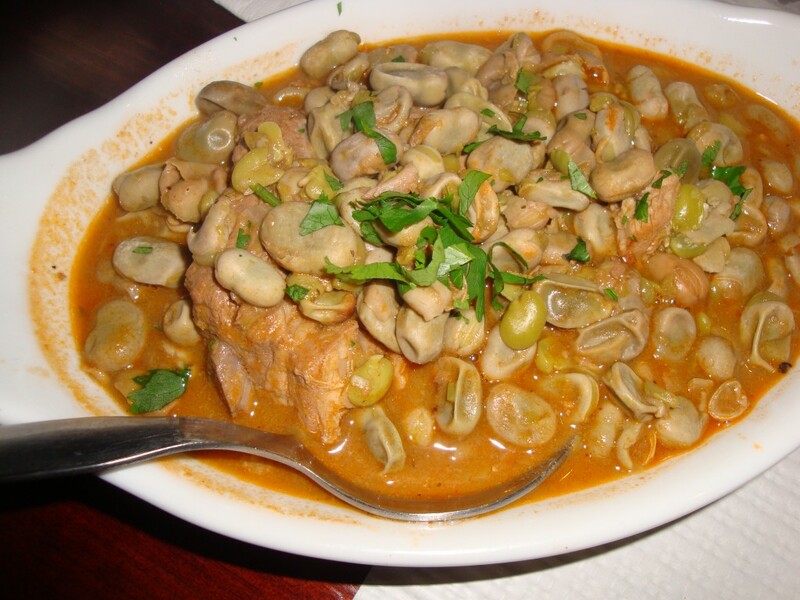 First, we tried the traditional broad beans with pork ribs. We ordered this as one of the more traditional dishes and it was decent. The beans were somewhat bland and weren’t visually appealing, but the pork and sauce was delicious and great for dipping your bread! Next up, we ordered fried rice balls. They were delicious! Crispy on the outside and warm and gooey on the inside, they were filled with cheesy rice. So simple, yet so good. The crispy apple and goat cheese roll was somewhat of a disappointment. We were expecting the bright crispness of the apple and the tanginess of the goat cheese to meld together in this appetizer, but it was actually somewhat bland. We also had a massive cheese and smoked meats board that was absolutely incredible. The Azores have a very large beef industry and thus cheese and beef are staples in the Azorean diet, along with seafood of course. On to the entrees! My favorite dish of the entire trip was a sesame crusted ahi tuna dish. It was served with a side of yams, yellow sweet potatoes, and a mix of sautéed red peppers, onion, and cabbage. The tuna was the standout of the dish. The sesame crust was delicious and provided nice texture and the sauce it was paired with was phenomenal. It was like a mix of hollandaise, Dijon, and coconut curry. Trust me, it was amazing. So good in fact that I ordered it again when we came back here for dinner on our last night. The “fried” veal fillet was spot on as well. 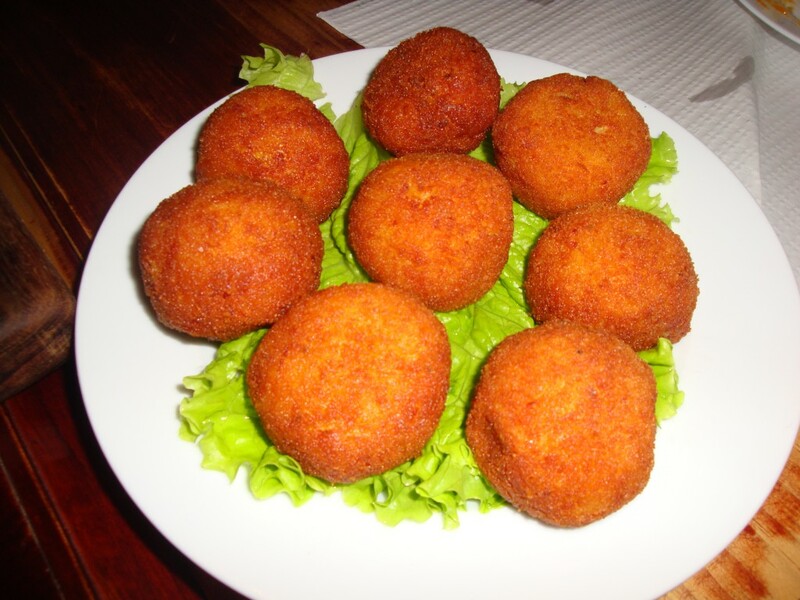 The Azorean version of “fried” is not what we often think of in terms of something that’s breaded and fried and comes with a crispy, golden crusty outside. Instead, the meat was just dipped directly into the oil for frying. We ordered the veal fillet with the “traditional” sauce which was a mix of oil, butter, garlic, and red peppers. 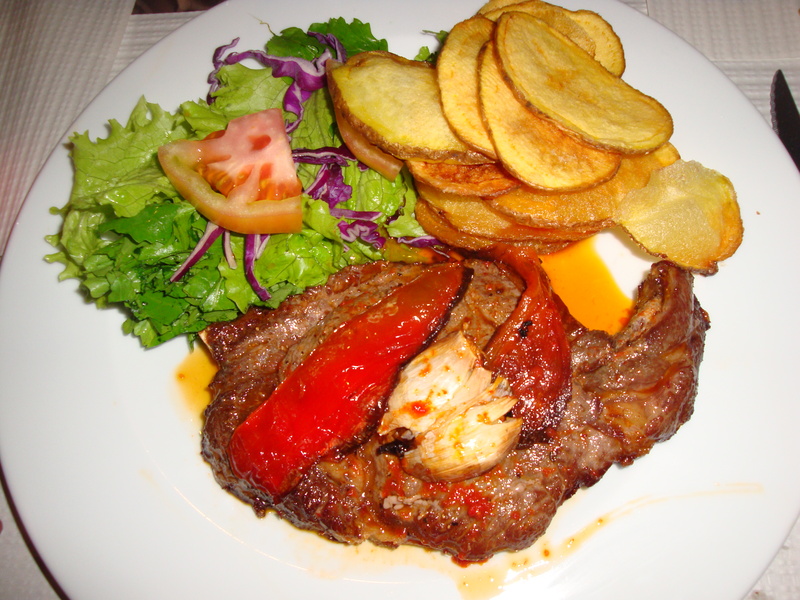 Red peppers are very commonly included in Azorean cuisine. My mother and father in-law both ordered the seafood stew. 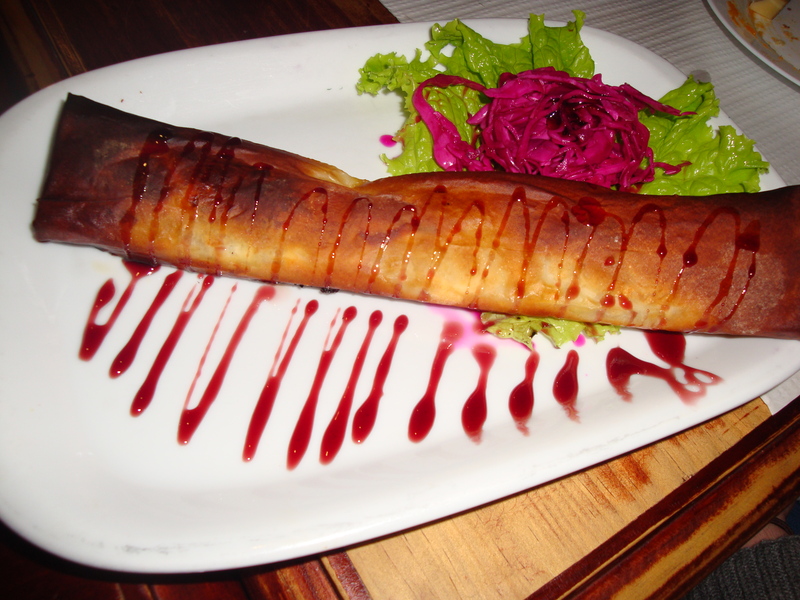 This was a very traditional dish and widely available at many of the restaurants we dined at. However, the seafood stew was a bit too exotic for them and was not one of their favorites. 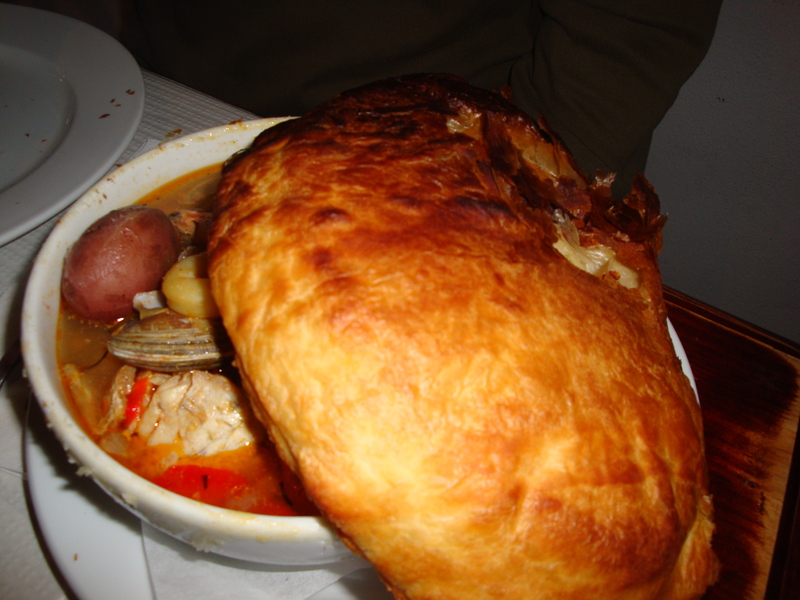 It contained a variety of seafood, including skate and prawns. The stew was basically seafood boiled in water with very minimal seasoning. Also, the seafood came whole so it was a bit laborious to eat. One of my sister-in-laws ordered the “Sargo,” also known as White seabream. 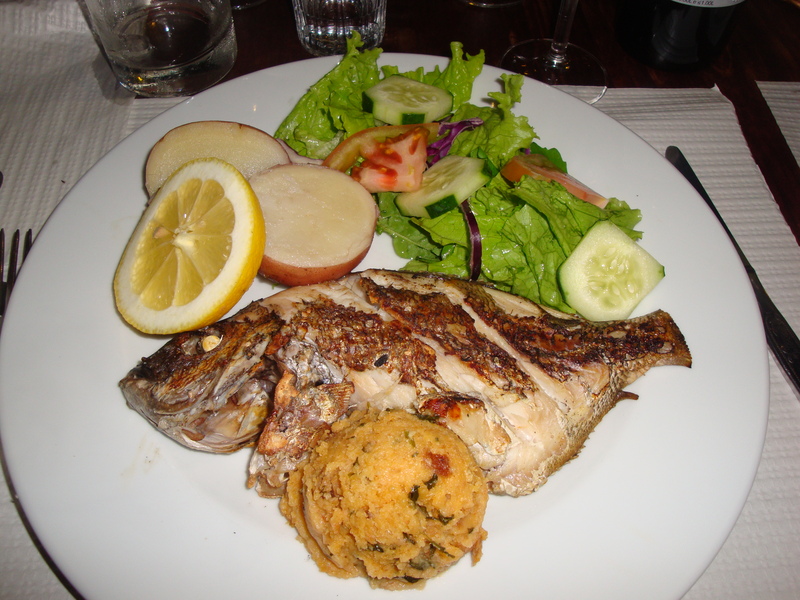 It was served whole, as many fish dishes in the Azores are, and was accompanied by a simply dressed salad and boiled potatoes. 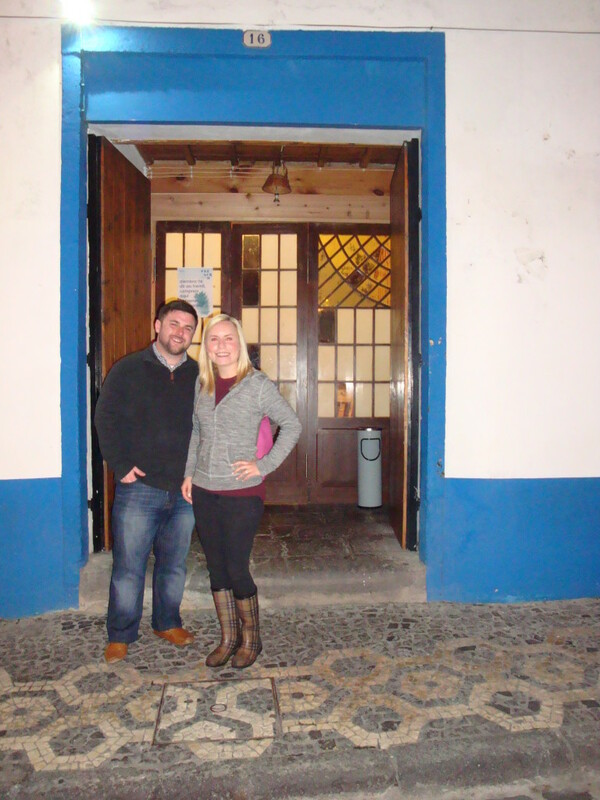 Overall, we loved Tasca and ended up coming back for dinner on our last night in São Miguel. I highly recommend this restaurant if you ever visit the Azores! It had a great variety of fresh seafood and traditional, yet approachable dishes. It was a bit of a challenge to find at first, as the door is barely marked, but that added to the adventure of it! We stayed in the capital city of Ponta Delgada on the island of São Miguel. Ponta Delgada was very clean and we generally felt safe walking back to our hotel after dinner every night. A good breakfast is hard to come by, we generally ate breakfast at our hotel because it was included in the price of our room, but we stuck to fruit and pastries. When we ventured out for breakfast we found decent omelets and pastries. The local beer is called Especial and it is light and refreshing and is generally only 2 € for a large glass. 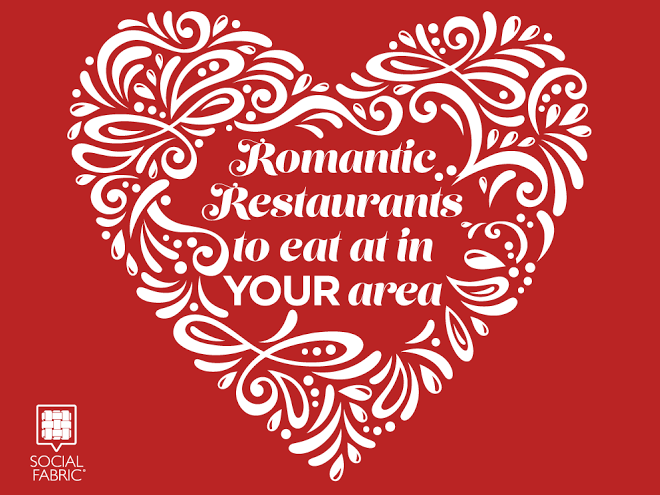 A few of the best restaurants are only open during the main tourist season between April and September. Over the next few weeks we will be sharing a series of posts documenting our trip to the Azores! The Azores is an independent region of Portugal that is made up of nine volcanic islands located in the Atlantic Ocean. We visited the island of São Miguel. Although we visited the island during the off-season, it was still beautiful and the travel deals are great at this time of year! However, I would definitely recommend going during the on-season—April to September—so you can see all of the flowers in full-bloom, bask in the warm sunshine, and actually see the sights sans dense fog. São Miguel offered lush, untouched landscapes and a relaxing atmosphere. You can reach the other eight islands via short inter-island flights and some of the islands are connected by ferries. 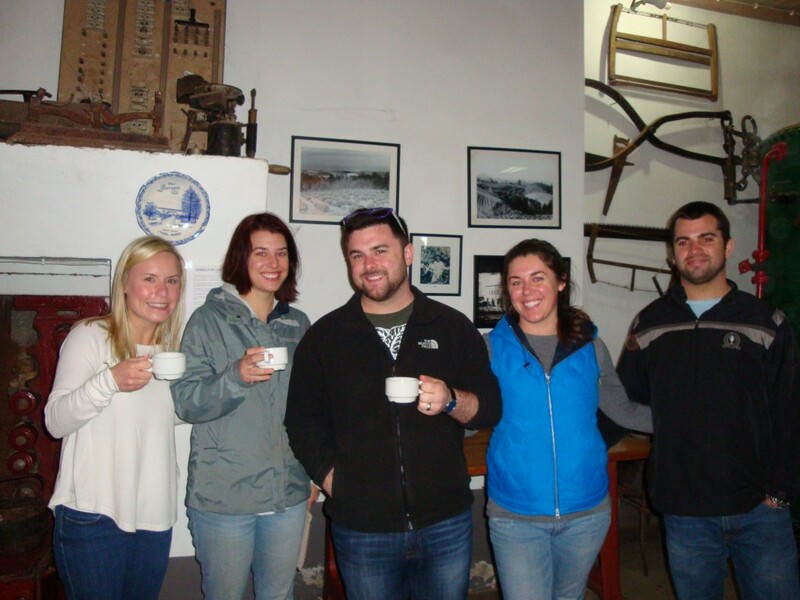 We toured Chá Gorreana, one of São Miguel’s two working tea plantations. Chá Gorreana is Europe’s oldest tea producing company and has been Portuguese family owned and operated since 1883. 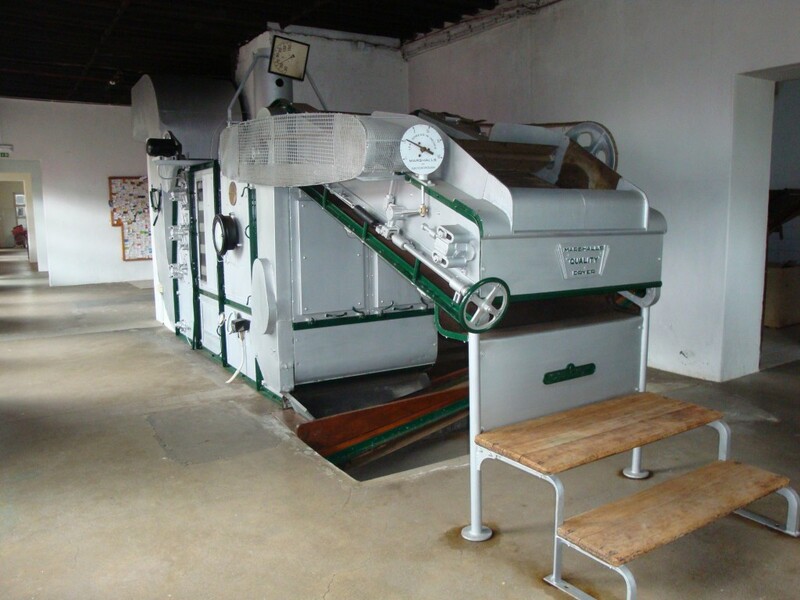 The plantation is eco-friendly, the factory is powered by a stream that flows through the estate, and no pesticides, fungicides, or herbicides are used in production of the tea. 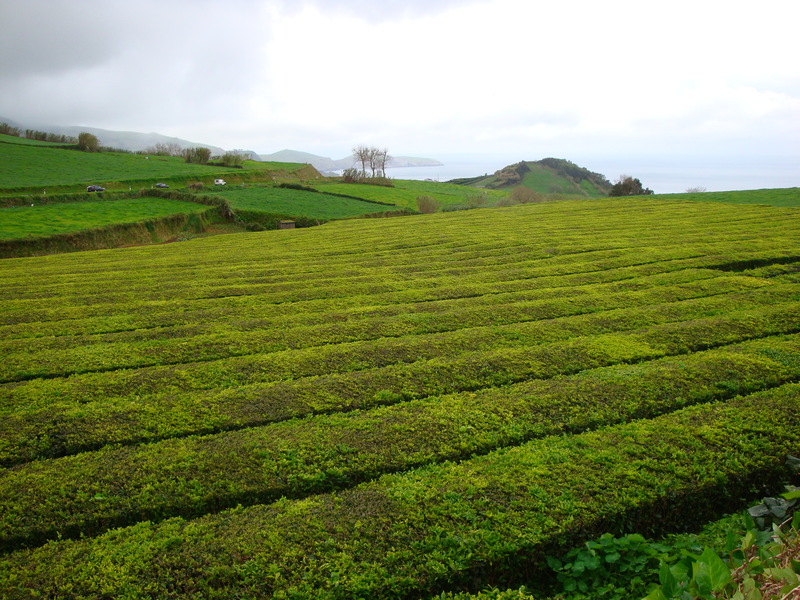 The mineral rich soil combined with the ocean air and temperate climate make the Azores the ideal location for the production of tea. 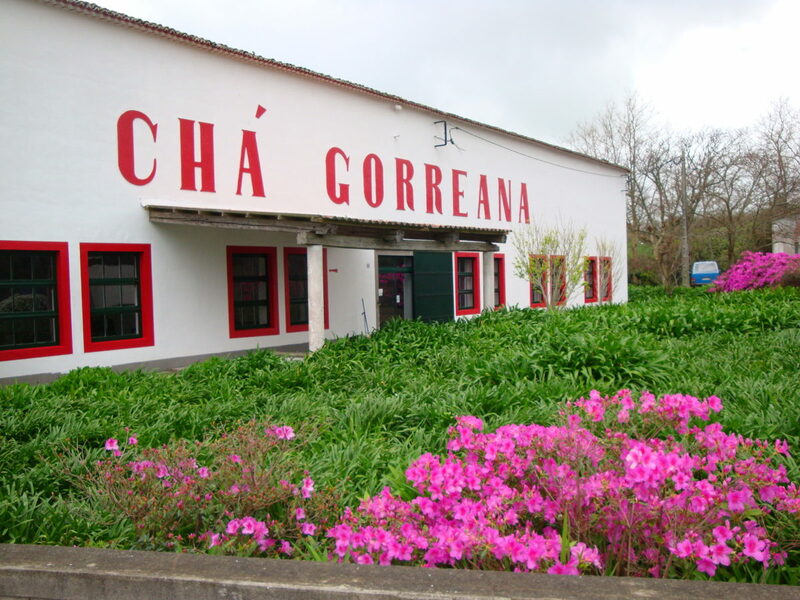 In fact, for over a century, Chá Gorreana has produced the only tea grown commercially in all of Europe. Both green and black tea are grown on the plantation and they are intermixed within the same hedges and sorted later in the harvesting process. 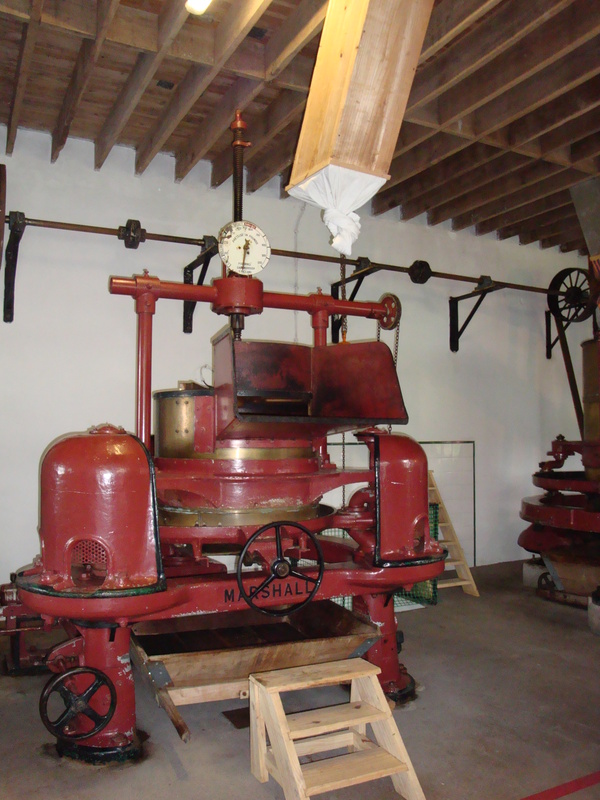 We toured the factory and learned about the machinery used to harvest and package the tea. The artisanal farming methods the plantation uses for harvesting the tea hasn’t changed much over the years. 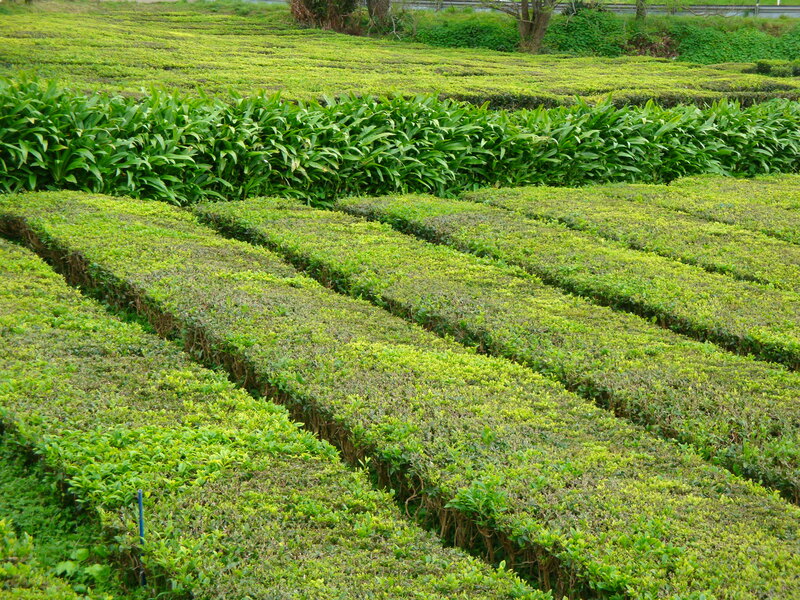 Harvesting the tea, which occurs from April to September, is a very delicate process that requires close attention. 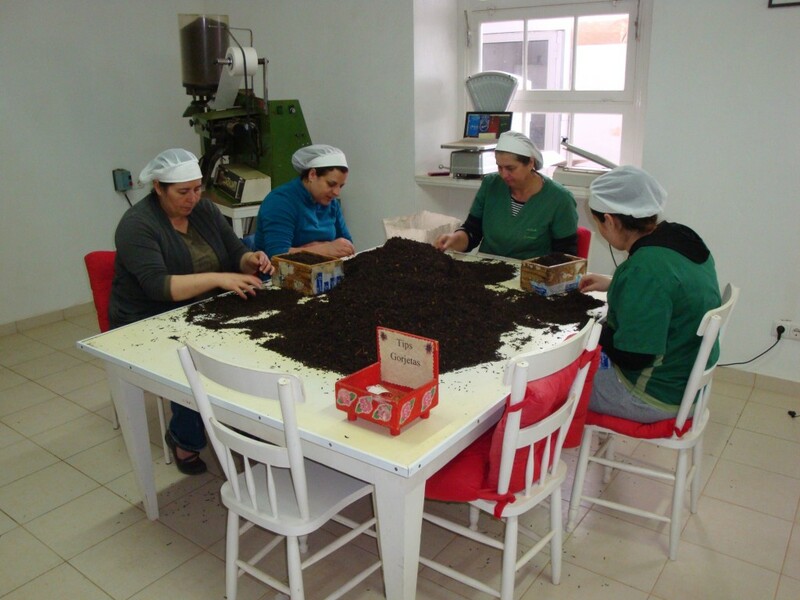 The factory workers expertly hand sort the tea to ensure quality and perfection. At the end of the tour we sampled the plantation’s various offerings, including: green tea, jasmine infused green tea, orange pekoe, black tea, and black tea infused with bergamot. This was perhaps my favorite part of the tour, all of the teas were delicious and rejuvenating. We bought some of the green tea and jasmine green tea to bring back to Dallas with us. 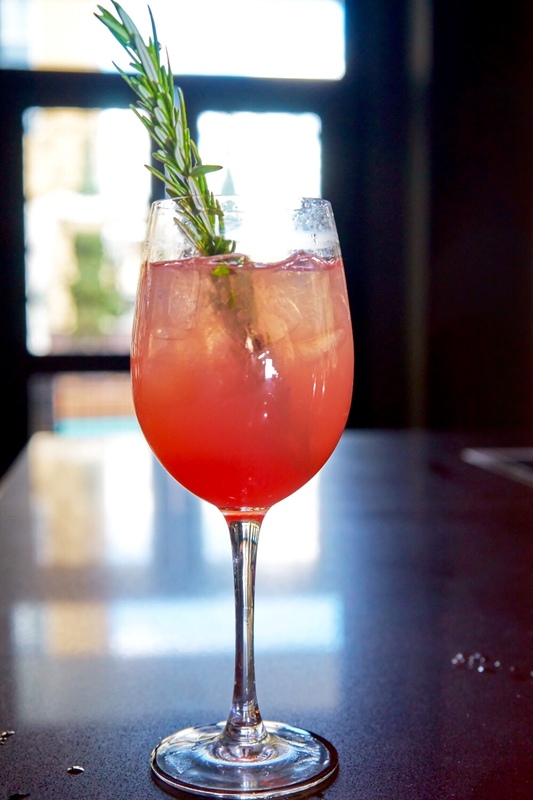 You can learn more about Chá Gorreana and purchase their products here. Overall, the tea plantation was definitely worth visiting, especially for a tea lover like me! 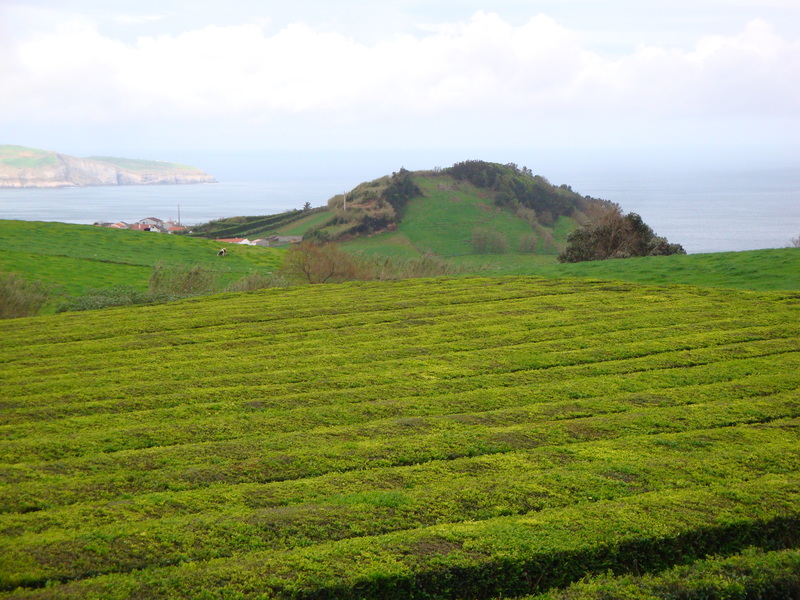 The tea fields surrounded by panoramic ocean views were stunning, even on an overcast day.